Just as important as any other element in a construction project, the selection of the right formwork greatly affects the project’s schedule, labour requirements, quality, and total cost. Over the years, formwork moulds have evolved from traditional job-built timber to pre-engineered systems composed of a combination of steel, aluminum, manufactured timber, plywood, and plastics. The traditional formwork relied on skilled craftsmen and the result was often inconsistent safety features, slow onsite construction rates, as well as large levels of waste. Today’s formwork moulds are mostly modular and provide increased accuracy as well as minimized waste. These advancements have led to increased jobsite production and safety, with less labour, while producing a better finished product. 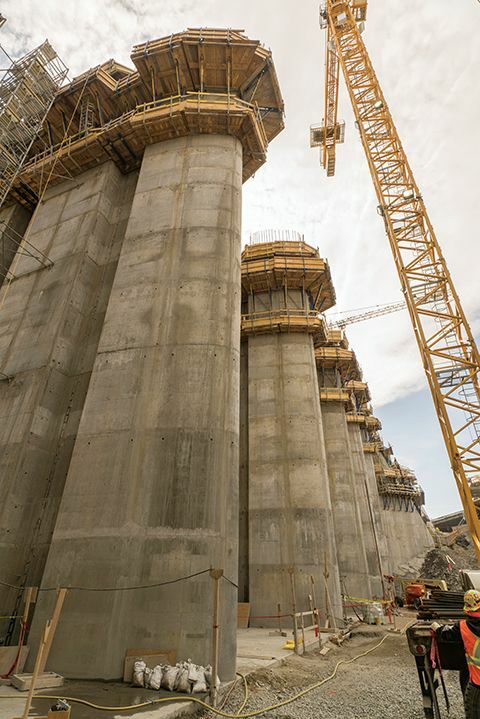 Modern formwork moulds need to be capable of shaping and supporting the concrete until it cures, but they also must withstand all of the weight—concrete, labourers, and equipment—placed on them without distortion. Moulds should be designed so they can be easily handled by hand or by equipment while achieving the required number of reuses. Further, their face material must consistently produce the contractor’s desired concrete finish, whether smooth, textured, or with exposed aggregate. Less than 20 years ago, a dozen major formwork systems were readily available in North America. However, in the short period since, many more European forming companies have entered the North American market, more than doubling the number of systems available. This increase in competition is pushing innovations to a rate previously unseen in the industry. Thirty-year-old systems that have enjoyed wide use and popularity are being supplanted by new, modern systems that offer greater productivity and a higher-quality product. Traditionally, the most prevalent system in use for hand-set wall-forming are steel-framed, wood-faced panels that require consumable ties at 0.6 m (2 ft) on-centre (o.c.) and 10 connections per 1 m2 (10.8 sf). These are being replaced with larger, two-person handset systems that require less labour and eliminate consumable purchases with the use of reusable taper ties. 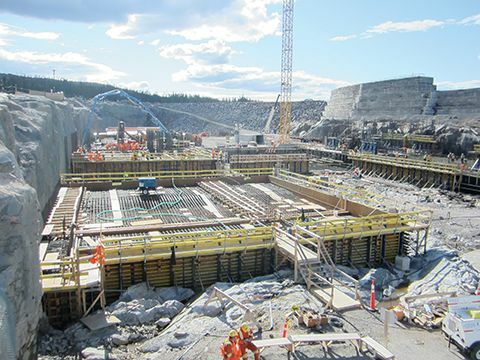 The photo above shows Canada’s largest current construction project, the development of Muskrat Falls located on the lower Churchill River in Labrador. This will provide a clean, renewable source of electricity to meet the province’s growing energy demands. Gang-forming has completely changed over the past 10 years. Older systems of steel-framed wood or steel-faced panels with double-channel stiffbacks that connect with bolts/pins have been overtaken by clamp connection forms with wood or plastic form faces that provide tremendous labour savings in assembly and use. These standard systems assemble and reconfigure very quickly to meet changing structure dimension while also providing a consistent concrete finish. With each new innovation, come new and better safety features. As conditions vary for each individual project, there is no simple formula for choosing the right formwork supplier or system. Formwork typically accounts for 40 to 60 per cent of the total cost of a project’s concrete frame. These percentages include the expense of material and labour, with the largest cost going toward labour. It is important to analyze labour costs thoroughly, as this is the bigger number and its reduction has a much greater impact on bottom line costs. Is the required material readily available? Does the supplier manufacture the material or does it purchase from another company? Does the supplier provide onsite field service to train and reduce the learning curve of the formwork crew? How safe is the system to install, use, and dismantle? Can the forms easily be climbed, and are tie-off points built into the system where required? What experience does the firm have with similar types of projects? Does the supplier offer engineering services? Will the supplier provide formwork assembly drawings specifically for the project or only provide general drawings of the system? Another consideration is whether to purchase or rent a system. This decision should be based on the duration of the project and the overall strategy of the construction company. Typically, if a form system has to be rented for more than eight to 10 months, purchasing the system might be more economical. However, along with the purchase of a system, there are additional costs such as maintenance and storage. Some formwork companies, however, offer services for customers who purchase their equipment. The quality of the product also must be considered in the decision-making process. Steel-framed wall formwork with standard plywood facing requires more maintenance and repairs throughout the life of the form than hot-dipped galvanized steel frames with specially manufactured plywood designed for longer life.